I try not to use the bus into Stratford these days, the traffic that backs down West Ham Lane is ridiculous and it can take ages to just get through. Then after that you have to deal with another set of lights and then another. It's slightly more bearable heading out of Stratford but still far worse than before the gyratory was tampered with. Talking of things that move really slowly, I was at City Thameslink yesterday and needed to get to Aldgate. I had the option of walking to St Paul's, descending the escalators, changing all the way from one end of Bank/Monument Station then getting the Circle/District or getting the 25 which had just pulled up at the stop and where Aldgate was 8 stops away. Needless to say I should have gone through all the faff of getting the tube. There was very little traffic yet the bus took 25 minutes to get to Aldgate, it was pathetic the speed the driver was travelling at. Especially since I was chasing down that RM and had to be there before it departed. What should have been a simple trip to Ilford was hard work today. The 5 doesn't actually seem to be managing badly, probably helped by the fact it has far too much running time in its timetable. Quite like the 185 route - it’s pretty fast most of the time! Haven't done this for ages, but I do feel the need to process such an exhausting yet enjoyable day. Thanking Go-Ahead, Stagecoach, London Bus Museum and TfL for organising such a spectacular, meticulously planned day out in East London and one of my most rewarding trips ever taken. H91 to Lampton Corner (VH-----): One benefit of these Gemini 3 B5LHs is that they are infinitely faster than the previous SPs, providing noticeably quicker journey times along the Great West Road. Piccadilly Line to Green Park (1973 stock): I absolutely loathe using this line for long distances, but going via Waterloo would get me to Barking far too late. Despite a long wait at Hounslow East, the journey wasn't too cumbersome or even crowded. Interestingly, a 1996 stock was undergoing brake testing between Northfields and South Ealing, covered in graffiti. Jubilee Line to West Ham (1996 stock): Somehow this was way worse than the previous tube journey - a 7 minute gap on an intensely used underground line in Central London can never end well. The journey was slow as people tried to squeeze on and stepping out into fresh air at my destination certainly was a relief. c2c to Barking (Class 357): I was slightly worried when the dot matrix screen announced that this would be a 4-car service, but luckily the trains via Rainham don't seem to get particularly busy apart from during rush hour. 23C to River Road Bus Garage (RT4779): It's been ages since I last rode an RT, so this was a pleasant and fairly popular trip down to River Road - certainly much nicer than the New Routemasters on the regular bus services. The frequency of heritage specials on the 62 and 23C combined was quite amazing, whilst using the 'ELT only' road by Vicarage Field was a surprising but greatly appreciated move. 62 to Creekmouth Power Station (RT3933): Only a 15 minute ride, but certainly the most enjoyable. Travelling down the length of River Road itself was superb, just surrounded by ongoing industry, huge factories, lorries and concrete. Having an RT floored was through here was also brilliant, even if it struggled a bit with the poor road surface! A film crew were also present and there was a little bit of conflict between one member and our driver - suppose they didn't think bus services went to this part of London anymore. The industrial surroundings were then juxtaposed by the newly developed Barking Riverside, which our bus entered in order to head back to the garage. Apartment buildings are surrounded by green communal spaces and water, whilst the Rivergate Centre was thriving on a Saturday afternoon. We also got to head down a half-finished Handley Page Road, which even has bus stop markings in preparation for when the EL3 can physically make it down here! A spotting session at River Road turned out to be my most productive, with the layout being very photography friendly. I even managed to catch RT1 here! 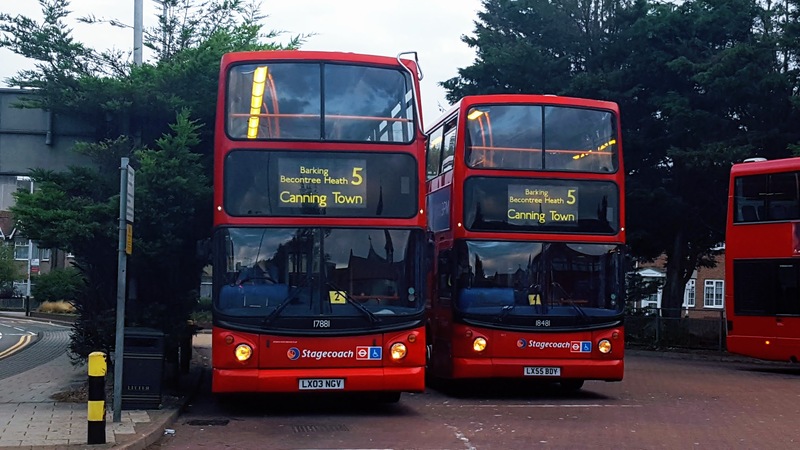 291 to Barking Garage (RF354): I had to wait for quite some time until an RF arrived, but having never sampled one before I was determined to catch one. It was pretty busy again ; prior to its arrival there hadn't been a single bus to Barking Garage for around 15 minutes, so an enormous queue had begun to snake its way around the modest display at River Road. Nonetheless, the arrival of around six RTs simultaneously managed to mop up most of the crowds and I was able to enjoy these wonderful vehicles once and for all. They really do have a beautiful engine and I look forward to trying out some more at future running days. 62 to Little Heath (RT1784): Barking Garage had a much more extensive display of buses available, although my first visit was brief seeing as the only 62 departures to Little Heath were about to leave. These ones only had a few passengers, but it was nice to travel through Goodmayes on a 'proper bus' and the end destination allowed a couple of photographs of the 396 to be taken, seeing as Go-Ahead commenced its operation on the same day. EL3 to Barking Garage (LT---): Unfortunately, waiting to snap E207 meant that I missed the RT departures back to Barking Garage, but this ride did at least allow some sustenance. BK was even busier this time, with RTs from the 62 gradually filling up the yard in preparation for the procession. Some lucky enthusiasts managed to obtain an aerial view from the top of a Mega Sightseeing ALX400, although my main focus was finding a good photography spot for the cavalcade, so I left prematurely to hunt one down. Even this was slightly too late, but I managed to squeeze in between a lamp post and crossing, which surprisingly paid off despite the sea of surrounding enthusiasts. After this, despite my prior knowledge that the procession would be returning, I jumped on an EL3 to Barking Station on the off-chance that another shot would be possible. The timing worked out perfectly and a few other tactical enthusiasts managed to obtain their 'money shots' here too. A slight social detour to Vicarage Field was brief but enjoyable, alas I could not stay given the large volume of service changes to also cover! Hammersmith & City Line to Plaistow (S stock): I don't actually know why I took this out of Barking rather than the faster c2c, but a last-minute decision to snap the 262/473 at Plaistow did actually pay off an allowed these changes to be covered much faster than anticipated, regardless of my non-existent preparation. District Line to West Ham (S stock): It was one stop, pretty uneventful. c2c to Fenchurch Street (Class 357): The last part of the day had been quite relentless, so it was nice to have a relaxing ride into the City just as the sun was beginning to set. This train was surprisingly quiet too, which was a bonus. 25 to St Paul's (WH): After having obtained a photograph of a new Streetdeck heading East, I'm glad that I was given the opportunity to ride one for a few stops. They are bizarre vehicles, being pretty noisy for alleged hybrids. They make high-pitched squealing noises on top of a growl, especially at the high speeds that my driver wasn't afraid of achieving up King William Street. The suspension is pretty shoddy for a new vehicle, whilst one of the poles already had blue tape on it. 11 to Trafalgar Square (LT67): Somehow until yesterday I hadn't taken this route for years, but during the golden hour it was a rather pleasant ride through zone 1. A cycling tour in front of the vehicle meant progress was slow, but I wasn't in any particular rush at this point. Charing Cross was certainly a lively place to be yesterday, with Sunderland fans taking up the entire of Trafalgar Square and being as rowdy as ever. I managed to tick off the 87 and 176 LT workings along the Strand, which meant there was only one thing left to snap. Annoyingly, whilst waiting at Bedford Street for the latter working I saw OM1 in the distance gliding past on the 26 - if only I had checked LVF! 6 to Piccadilly Circus (VWH): I honestly forgot that this doesn't go down Regent Street anymore, which was slightly annoying given my plans to snap along there. Luckily, only a short walk was required from Piccadilly and the first 88 shot to Parliament Hill Fields, a conventional Enviro 400H, actually turned out okay despite the darkness. Usually, I like to go home via Paddington and Great Western Railway, but from Regent Street taking one bus there isn't possible anymore and I really couldn't be bothered to walk back for a 6 or up for a 7. I chose to suffer on the Piccadilly, again, but at least it was one of the only units with the barman moquette. All in all, a superb trip out which will definitely encourage my attendance at future running days! 431 to Sevenoaks ...what a great bus this was. Good number of passengers too. 401 to Westerham...again, credit to Go Coach. Was nice listening to Radio 1 over the bus speakers. Did you get an LT? Interestingly this was the first time I passed through the route in daylight - all other routes (185, 40, 42, 484) were done after dark! R8 to Orpington Station (162) - Finally managed to try out the R8 for the first time and 162 was my ride. Kinda hoped for an MB E200 that I hadn't had before, since I've had 162 before on route 162 and 138. Once we went past Downe Village, I was shocked to see how narrow the roads were! I remember some of the controllers at Croydon telling me that the R8 is one of the most difficult routes to control and it is for that reason. Any delay or blockage can cause a huge delay for the route and in some cases it can force it to be suspended entirely! I was amazed that the Enviro 200 could just about fit but took up the entire road. Was also very rare for me to be on a London bus in the middle of the countryside with just fields around but we soon reached Farnborough Hill and had a peek into MB on the way before reaching Orpington. All in all the R8 is a very nice route but I do think it could be rather pointless considering that it runs around the countryside where there's nobody about for most of the route. The surprising thing is that the R8 runs longer time wise than the 434, it finishing at 21:50 whereas the 434 only run until 20:30. 353 to Hayes Station Approach (969) - Eventually 969 turned up and it was great to see a Scania again on route 353 considering they had just got rid of the ex 405 OmniDekka's. I wonder how long 968 and 969 will last though before they are finally replaced. 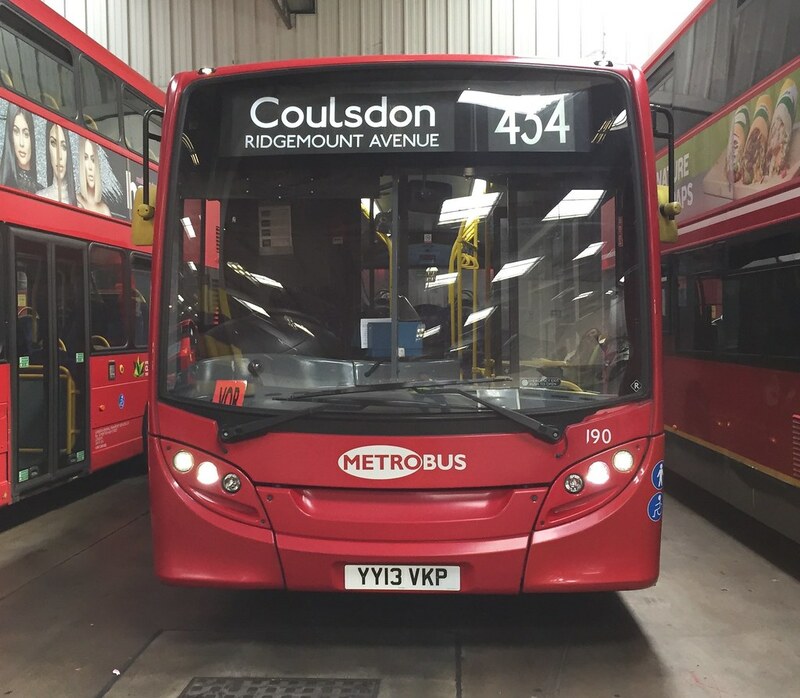 Was a good ride and way better than the Enviro 400's that now serve it. 138 to Bromley North (188) - Was good to get the bus that came before the 434's Enviro 200's again, albeit now refurbished. The bus had a slight turbo whine however, and we were diverted once we reached Bromley Town Centre. Not quite sure why the town centre is completely blocked. 146 to Downe (36618) - Another rural route but not as rural as the R8! This trip however was filled with diversions galore as we were diverted upon leaving Bromley North and then had a massive diversion between Keston and Downe which saw us miss out Hayes completely.